In one's ever-going quest to find unique angles and views of traditional theme park subjects, sometimes, sometimes, one must go completely out of the park and gaze back in. Such is the case with the angle below, which is taken from the Mickey and Friends Parking Structure. 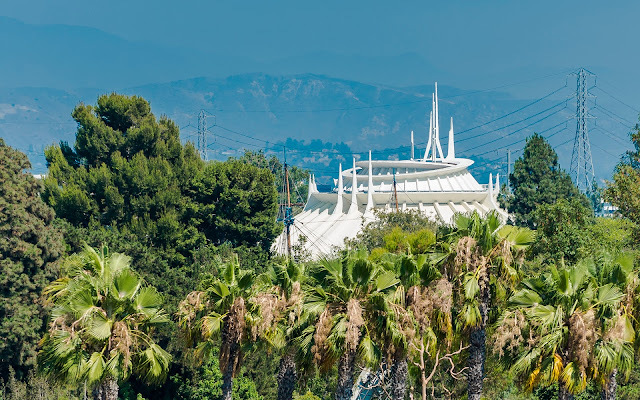 Here, if not for the power lines and the bits of architecture in the far background, Space Mountain might look like it was arising out of a lush wilderness--a standout in a naturesque setting. The context gives the environment away, but I still thought this was an interesting perspective of an iconic attraction! A different angle of Space Mountain gives a unique perspective.